Located in a broad, high valley southeast of Mexico City, Puebla was established by the Spanish in 1531 as colonial Mexico’s capital city. Designed by a Spanish architect, the city has much more of a European feel than any other in the country, with a historic downtown that boasts 16th century baroque buildings. In addition to the elegance of its buildings, Puebla is famed for textiles, pottery, and delicious cuisine. Upon your arrival in Mexico City, you will be met by your guide before heading south to the UNESCO world heritage city of Puebla. Before transferring to your hotel for check-in, you’ll have your first meal in Puebla, featuring eclectic combinations of native dishes with Spanish accents. Located in the center of the city, your accommodation is a family-run boutique hotel housed in a colonial style building, with wooden doors, traditional balconies, and a charming interior patio. Each room is uniquely decorated with rustic and antique furnishings, and the restaurant at the hotel serves delicious seasonal Pueblan dishes. This afternoon, visit the city center with your guide for a brief overview. Then, take some time to stroll the shady central plaza (or zócalo) on your own. After breakfast this morning, you’ll be met by your guide in the hotel lobby for a private tour of Puebla’s historic city center. Puebla’s city center features architectural styles that range from the Renaissance to the Mexican Baroque periods, and churches, monasteries, and colonial mansions decorated with multi-colored tiles (azulejos) for which the city is famous. You’ll visit the massive cathedral, for which construction began in 1575 and took over 300 years to complete, in addition to the Palafoxiana Library, established in 1646, and the first library in the Americas. 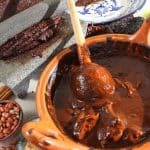 Lunch is included today, and offers samplings of Puebla’s famous mole poblano, which is considered the national dish of Mexico, and contains 20 ingredients that include chili peppers and chocolate, in addition to other regional specialties. In the afternoon, visit Cholula, an important city of pre-Columbian America, which dates back to the second century BC, and is famous especially for the Great Pyramid of Cholula. Built in four stages, beginning in the third century BC, for the deity Quetzalcoatl, the pyramid is the largest man-made structure in the world. The Spanish, awed and frightened upon their arrival by the devout nature of the Aztec worship in Cholula, attempted to usurp the spiritual powers of the indigenous peoples by destroying ritual centers and ancient temples, and by building churches directly on top of the foundations. You’ll spend the remainder of your time in Cholula visiting these many churches that run throughout the city. This evening, return to Puebla for dinner at one of the city’s traditional restaurants, where you’ll enjoy native dishes derived from corn, featuring interesting combinations of spices that first came to Mexico with the arrival of the Spanish. 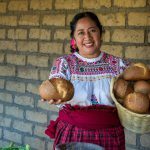 After breakfast, you will be treated to a Mexican cooking course at the hotel. 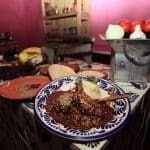 Puebla is considered the “gastronomic heartland” of Mexico, as it straddles the route from the Gulf Coast to Mexico City, and your introduction to Pueblan cuisine will include preparation of regional favorites such as salsa verde, salsa roja, chalupas, pipián verde, and arroz con leche. Enjoy your final dinner this evening at a local restaurant. Following breakfast this morning, you will be privately transferred to Mexico City for your departure flight home, or to continue on to your next Willing Foot destination.